Oranjestad is a distinctive and charming harbor city in the Caribbean island of Aruba. Visitors come to Aruba for the fantastic weather, the vibrant Caribbean culture, stunning ocean views, its white sand beaches, and plenty of adventure activities. As Aruba’s capital, Oranjestad has all this and more: old restored buildings, the earliest dating from 1798, along with high-end luxury malls and jewelry stores offering excellent deals, a rich history and a vibrant nightlife and some great deals on hotels and beachfront resorts. 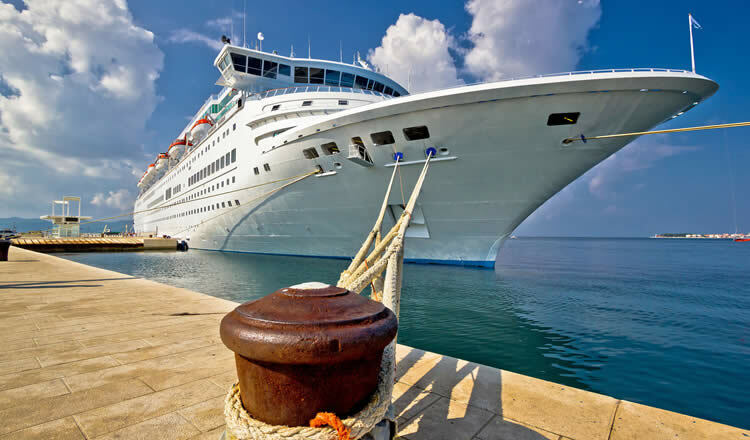 Cruise ship passengers to Aruba who arrive at the port terminal and would like to stay for a night or two have plenty of choices in hotels near the port. There are usually excellent deals on offer, since the city is home to a wide range of properties and has different accommodation options. You can stay at a high-end resort like Hyatt or Marriot just as well as at a small family-owned guest house or hotel if you’re on a budget. The majority of accommodation options are around the town center, in the south-west of the island and near the Queen Beatrix International Airport. Hotels closest to the town center will be a few minutes away, reachable from the bus terminus or via the streetcar, cab or a bike ride. These are most convenient for cruise ship passengers only staying in town pre or post cruise for a day. A few lodgings are located near Renaissance Beach and Surfside Beach, so that you can enjoy water and beach activities. Very popular are Eagle Beach and Palm Beach, white sandy beaches lined with luxury establishments and resorts. 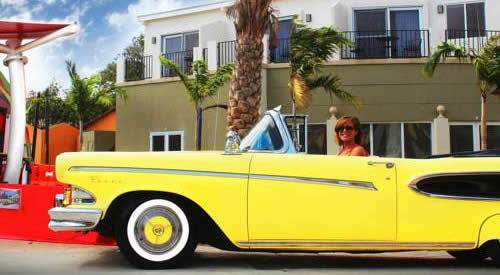 Both beaches are approximately 10 to 15 minutes away from the cruise pier by taxi or bus. There are plenty of other accommodation options in the western parts of the island, particularly around the beaches of Hardicurari, Malmok, Eagle, Divi, Drulf and Manchebo as well. You can find hotels and vacation rentals in these areas by searching online, and get great deals as low as $50 a night. Deluxe 4 star property set within walking distance of the cruise terminal. Luxury 5 star guest house accommodation in the centre of town. Close to port. 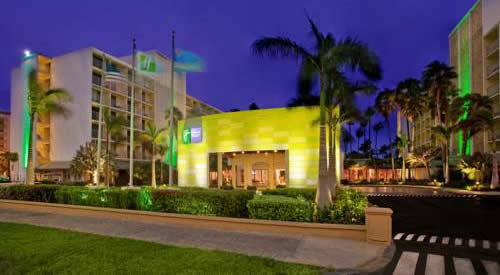 Beachfront resort hotel with casino set directly on Palm Beach. The port terminal in the harbor at Oranjestad sits at the south-western tip of the island. Cruise ships come in and leave all the time, and the terminal is walking distance from the main shopping street. The beaches are a 10 minutes’ drive away. The airport is about 2 miles from the port. The city is small, but the town center can be crowded. So some people prefer to live outside the town center. Everyday cruise ships bring crowds of tourists to the port terminal, and you can have fun taking the new trams or streetcars from the terminal to the town center. Cruise ships dock in downtown Oranjestad at one of the three cruise terminals, all located within walking distance of the city centre (5 minutes). The port of Oranjestad has a modern Cruise facility with ATM machines and shops. The main beaches (hotels and resorts) are located 10 to 15 minutes away by local bus and taxi. A major cruise line departing from the port is Windstar Cruises to mainly other Caribbean ports such as Bridgetown, Cartagena Colombia and Colon Panama. If you’re putting up at a hotel near the port, you can visit the nearby beaches and enjoy the water activities that are popular in Aruba. You can enjoy parasailing, boat rides, fishing and snorkeling, as well as simply lounging on the white sand beaches. Shopping is another activity that tourists love. The shopping street is walking distance from the terminal and can be covered in half a day. If you’re staying for longer, you can explore the natural beauty of the city’s nature parks, enjoy the architecture of its historic buildings, and have fun at festivals like the Bon Bini festival every Tuesday. Oranjestad is the pride of Aruba, and it has something for every visitor. Whether you are looking for shopping, surfing, nightlife, great food or simply relaxing, take a cruise from or to the city and you will not regret it. Queen Beatrix International Airport (IATA : AUA) is the main international airport on the island. The airport is situated about 2 miles from the cruise port terminal and downtown hotels. Taxi’s are available and will bring you to your destination (hotel). There are also bus-stops, serviced by Aruba’s Bus transportation company called Arubus, located just outside the terminal building. The Aruba Florin (AFI) is the official currency in Aruba. You will find plenty of banks and ATM’s. US Dollars are widely accepted. Dutch and the local language of Papiamento are the official languages of Aruba. Most locals speak English and Spanish as well. address : L.G. Smith Blvd 172.